As the costs of healthy foods continues to go up many of us who are dedicated to healthy organic look to find more creative ways to feed ourselves. That is the subject of this post. I have been a serious vegetarian in years past and I have many vegetarian as well as meat-eating friends as well. Many of my yoga friends are vegetarians due to ethical reasons. Some hunt deer for food, a process that provides their main source of protein. I always feel to each their own. No judging on my part. My philosophy is that we all eat to live and most of us eat something that once lived in order to stay alive. This process for me is more about doing this in a safe, honest and ethical way than about anything else for me. Eating safe meat is a huge issue today as the science is in and it has shown that factory farmed meat carries unhealthy chemicals, medicines and bacteria on top of the often deplorable way many of these animals are kept. This is where I draw the line as I cannot morally or financially support inhumanely raised animal practices. Loading the boxes of processed meat into the vehicle. I made a huge decision this winter. In the future I will only buy organic humanely raised meat. I know that this means a 42 % increase in food costs but the recent changes in my health requires this. So this means I have to get more and more creative to buy the highest quality foods that I need. In years past I dealt with the issue of increased grocery costs by eating less meat (keep my intake to about 3 oz. every third day) and making more soups, stews and stir fry’s to stretch a small piece of meat. Since I was diagnosed with Hashimoto’s’ I have been buying small amounts of organic meat at the Health Food store but the $13.50 a lb. has made this more and more difficult. I considered raising my own animals but roadblocks are there including not having enough land to pasture them, suitable barns and corrals to keep them in. And to tell the truth I do not have the emotional distance necessary to raise and slaughter my own animals. 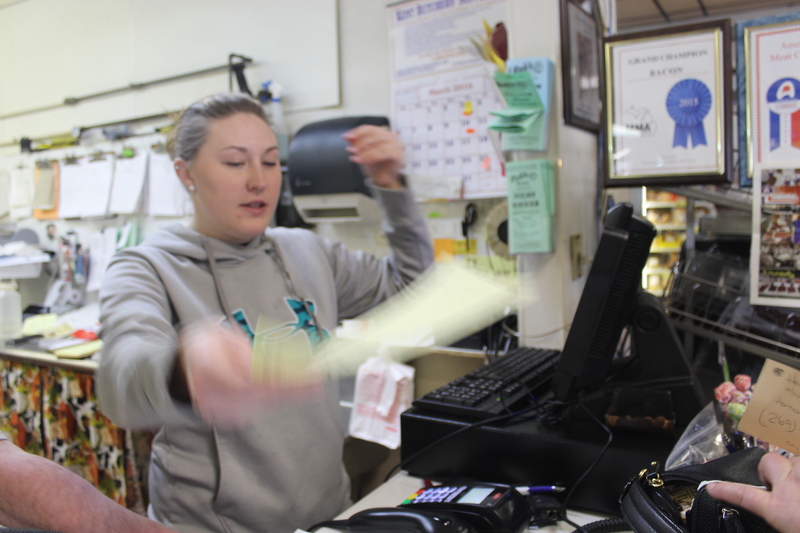 Looking at the sales receipt as we pick up the meat. I grow much of our own seasonal vegetables and raise chicken for our eggs. But I was having trouble dealing with the high costs of organic meat. 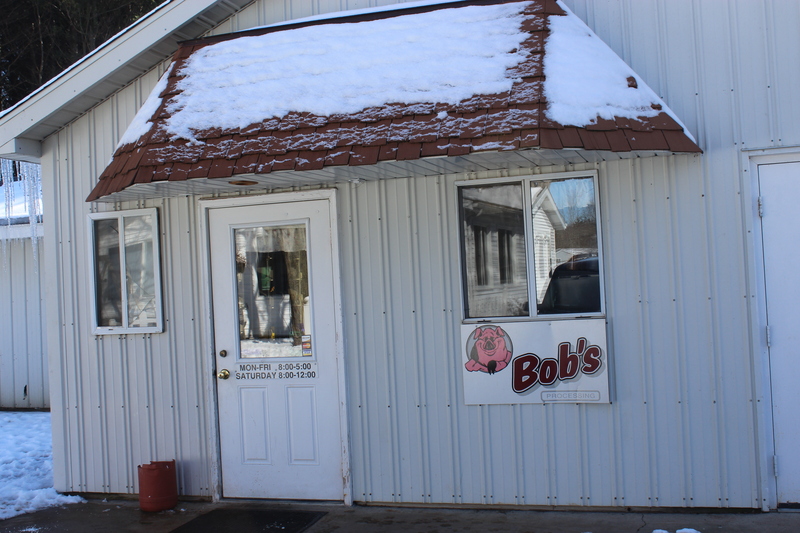 Bobs Processing Inc., of South Haven, MI a USDA approved meat processor. I had been buying organic meat at the health food store and by the time the farmers raised the animal and made their profit, then the store marked it up to make their profit, I was paying $13.00 and $14.00 a lb. for this meat. Something had to change. This winter I ordered and bought ¼ of a hog that was raised in the highest of standards. I know and trust the farmer who raised these hogs and believe this is the highest quality of meat possible. I ‘sold’ the other 3/4 of the hog to friends and neighbors to make this happen for us. 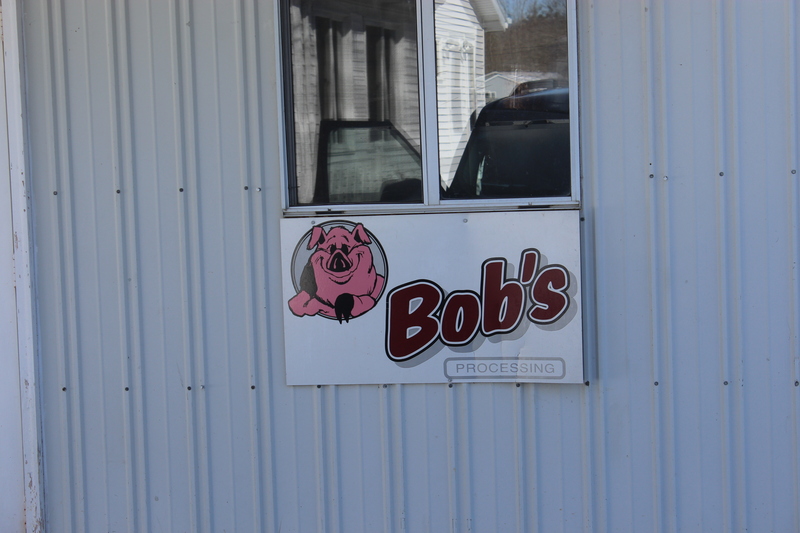 Our hog was raised by a neighbor, Anthony Winfrey of Forgotten Forty Farms and processed by Bobs Processing Inc., of South Haven, MI a USDA approved meat processor. This past weekend we cleaned out our chest freezer, thoroughly washed it out and made it ready for the organic raised pork that I picked up on Friday. 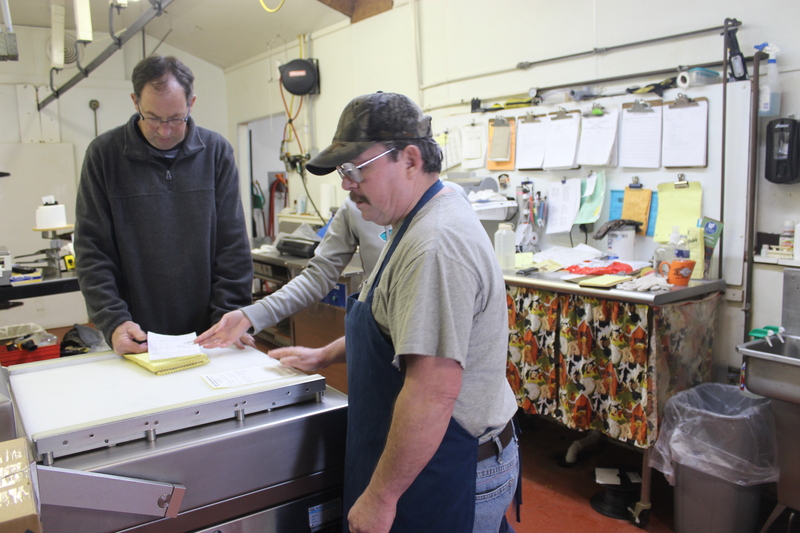 Buying directly from the farmer and making arrangement to have it processed cost me $685 a lb. total. Both parties made their profits and I now have a freezer of clean meat. Now that’s better. Many of you who follow me, know how I feel about eating organic and whole nourishing food, so I am probably as they say ‘preaching to the choir’ but if you have been on the fence about spending for organic foods, this may interest you. See more at: http://www.phoenixhelix.com/2015/05/30/sophies-story/#sthash.f60jKMHh.dpuf Eating organic is important for us all and especially for those of us who are fighting immune system diseases. As you now I have Hashimoto’s Thyorditis. Hasimoto’s is an autoimmune disease that affects over 10 million people in the US alone. Damaging the thyroid gland, it creates symptoms so wide-ranging and confusing that it can be hard to diagnose. My Hasimotos’ is why I must eat organic. Another podcast if great interest to the subject of eating organic is “Why Eat Organic” by André Leu: GFS Podcast 071, found on one of my all-time favorites podcasts, Gluten Free School (GFS) by Jennifer Fugo. If you have been on the fence about the value of organic, your mind is about to be opened. Gluten Free School is a dedicated teaching tools about being gluten-sensitive. This savvy woman gives us many empowering steps to get healthy. In fact, this is the number one spot for those living a gluten-free life who are seeking community, as well as simple & clear information about their condition, and looking for ways to become empowered and to finally feel better. Based on her personal journey, Jennifer Fugo, founder of Gluten Free School, is more than just about chat about a diet… it’s a healing revolution! Yes, it was a lot of work to find, sell and make the arrangements for this meat and yes the farm raised meat can be more expensive than meat in the grocery store but I believe it is worth it. I paid about $3.00 a lb. for the meat and with the processing it cameo out to about $5.00 a lb. Not cheap certainly, but not $13.00 a pound that I was paying in the health food store either. Its time to celebrate because my freezer is now full and I know I am on my way to better health. Yesterday the US experienced a strong mix of heavy rain, wet snow and tornadoes through the north-east. Time magazine said in a weather issue that came out last year that this is the ‘new normal’; meaning intense hard rain storms, tornadoes, snow storms and more. 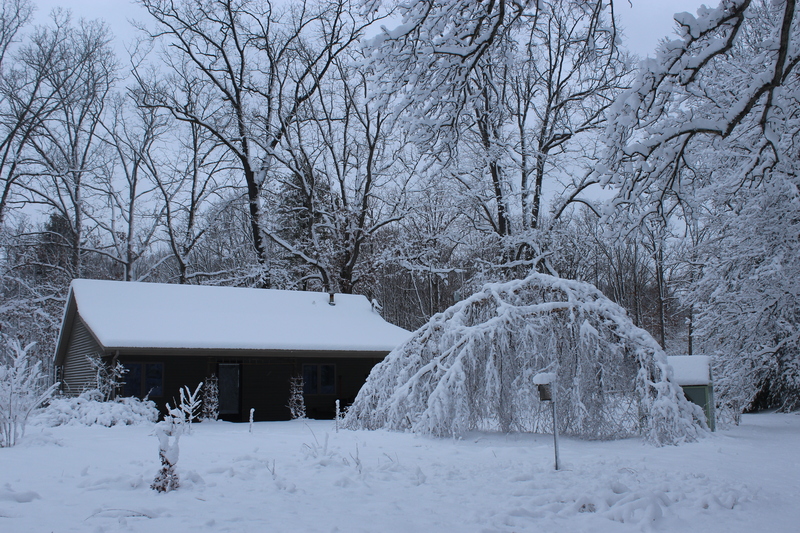 The heavy snow has doubled over the river birch tree. 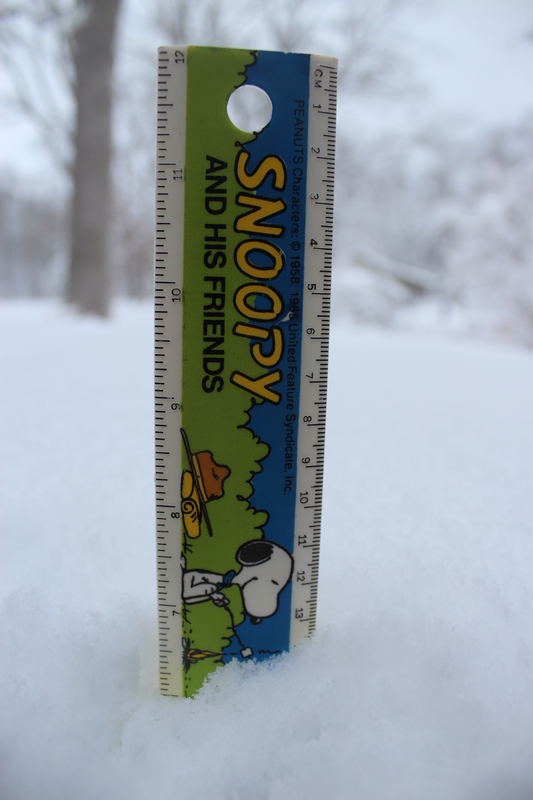 In SW Michigan we received about 8 -10″ inches of heavy, wet snow. It is beautiful to look at be sure however it is really physically hard to remove on an aging body like ours. On our homestead the chore of snow removal falls totally on us and this is with using a snow blower and hand shovels. 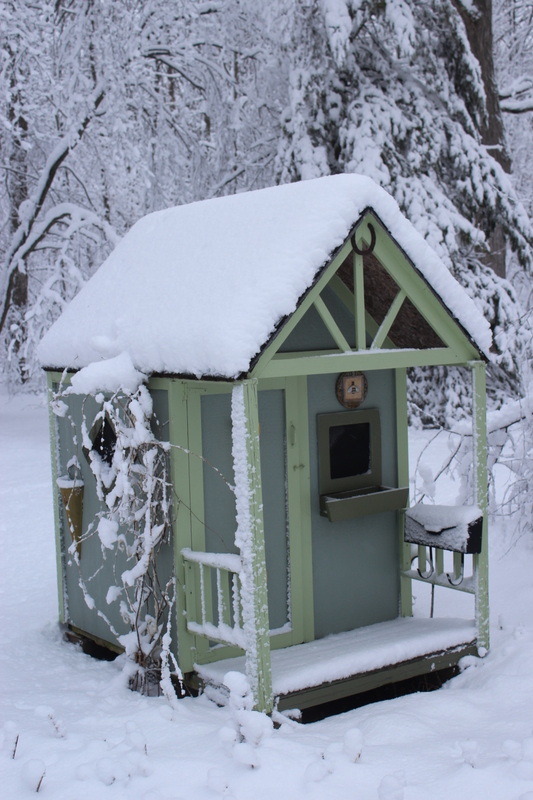 The playhouse looks adorable under the overnight snowfall. We do get asked sometimes, why don’t you just hire someone? Once when our snow blower was broken and we received 12″-15″ of wet snow dumped overnight we paid a local guy to come and plow our two driveways. Unfortunately he knew he has us over a barrel and charged us $90.00. I almost flipped out as Gene was making a little over $7.00 an hour at Menard’s at that time and that represented a weeks worth of income for us. Our retirees budget can’t sustain that on a regular basis so we must handle the snow removal ourselves. Snow on the roof of the covered run. I am thankful for having a covered run for the long winter months. 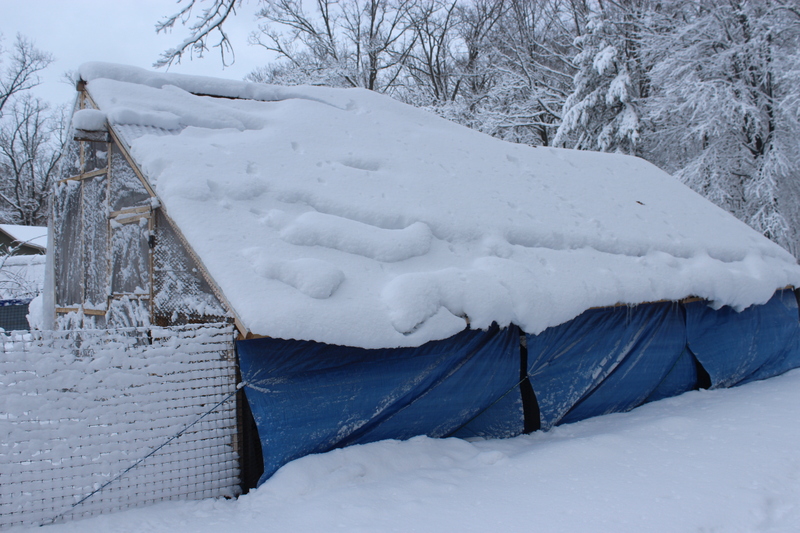 The hard plastic roofing panels on the covered coop run hold the snow and the three side tarps keep out snow but allow for good ventilation. The heavy snow pulled down our netting so repairs will be needed. I was really getting used to the unexpected patch of spring-like weather we have had here these past two weeks. I must admit I am disappointed that winter weather has returned. 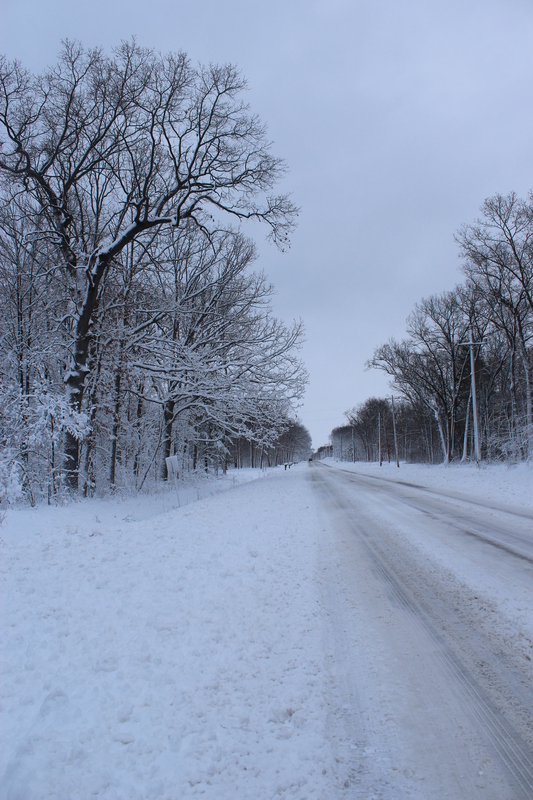 The main road in front of our home is deserted. We hustled and took advantage of the warmer weather to get some maintenance chores done. Gene washed, vacuumed and waxed my Subaru as well as vacuumed out his truck. We drove to the car wash and washed his truck and sandy undercarriage, as well as the dirty winter boot tray and dog kennel after the sick chicken was in it. 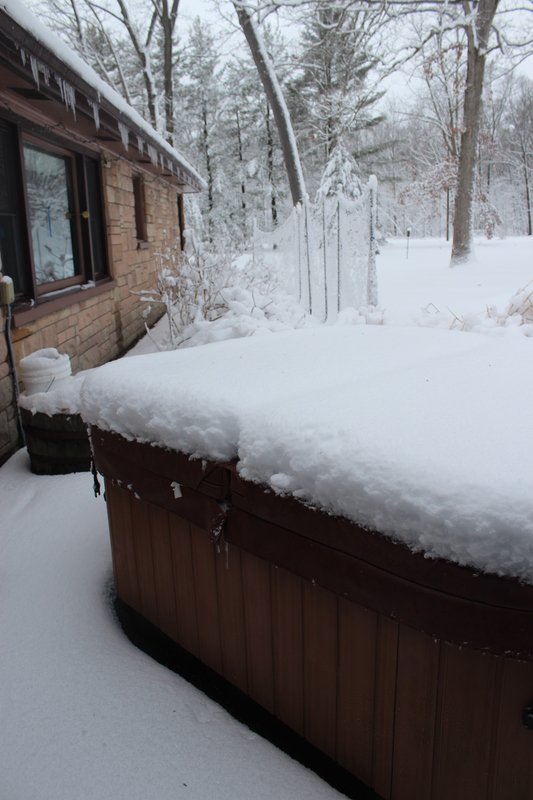 The snoopy yardstick says 6″ of snow on the hot tub cover. 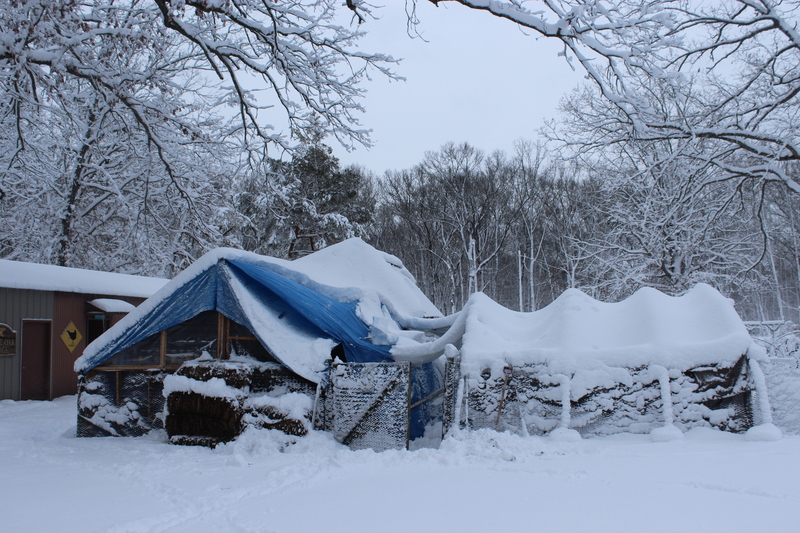 Our snow-covered hot tub and deer fencing. 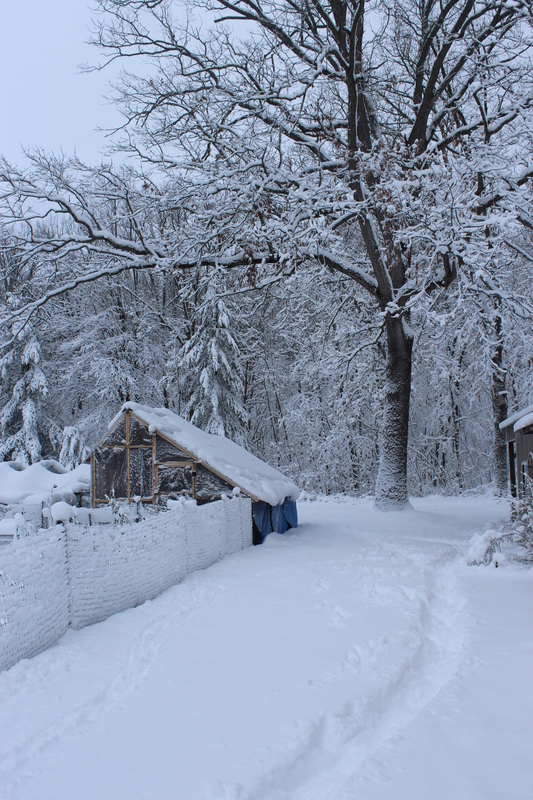 I also picked up load after load of sticks and twigs from the yard and spent hours outside with the chickens giving them a chance to free range as much as possible during the lull in the snowfall. I personally would have loved more time without snow but that was not meant to be. 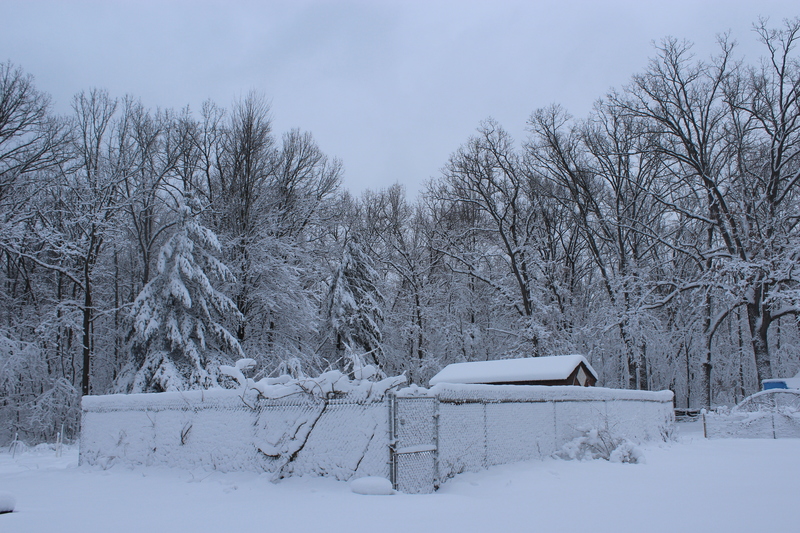 Thick snow has covered the chain link fencing surrounding our pool. Snow is now a mixed blessing here. Yes, it is very beautiful to look at and we do need the water in the water table but…this thick wet snow coating every surface means a lot of hard physical work head for us. Todays path to the chicken coop to do our morning chores. 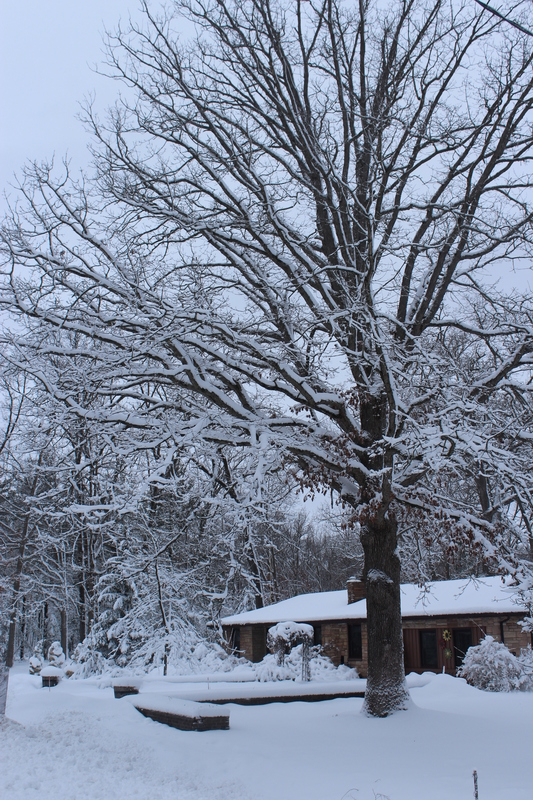 The giant White Oak at the front of our property is like a sentinel showing the way.